Text messages are a quick and easy method of communication, although for healthcare professionals the use of SMS messages carries considerable privacy risks. While text messages can be used to communicate quickly with members of a care team, the inclusion of any protected health information (PHI) or personally identifiable information (PII) violates HIPAA Rules. SMS texts are unencrypted, potentially allowing unauthorized individuals to access the messages and view the contents. SMS messages may also be stored on the servers of service providers. Those messages may remain on unsecured servers indefinitely. Copies of SMS texts can remain on the sender’s and recipients phone. In the event that either the sender or recipient’s phone is lost or stolen, PHI/PII in messages may be exposed. With SMS messages, there are no HIPAA-compliant controls to verify the identity of the recipient or for the recipient to verify the identity of the sender. The lack of safeguards in place to ensure the confidentiality and integrity of PHI and limited authentication controls means the sending of any PHI/PII over the SMS network is a violation of the HIPAA Security Rule. Technology has advanced considerably in recent years and numerous secure text messaging platforms are now available that incorporate all of the necessary privacy, security, authentication controls required by HIPAA. By using such a platform to send messages securely, healthcare professionals can communicate quickly, easily, and securely without risking a HIPAA violation. While those secure messaging platforms satisfy HIPAA requirements, the platforms have yet to be approved by the Joint Commission for texting patient care orders. While the ban on texting orders was temporarily lifted, it was soon put back in place over fears of patient safety. The use of secure texting platforms was also thought to place an increased and unnecessary burden on nurses required to enter texted information into EHRs. Due to the ease of communication via text messages, many healthcare organizations allow physicians to communicate with patients via text. Patients may even prefer to use SMS messages rather than logging into patient portals or calling their healthcare providers. As with text messages between healthcare professionals, the sending of PHI or PII via SMS to patients is also covered by HIPAA Rules. 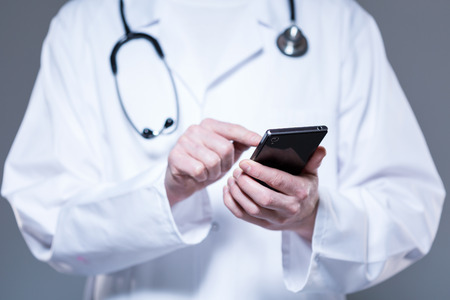 Any communications with patients via SMS have potential to risk the exposure of PHI and physicians and other healthcare professionals must exercise extreme caution. Even with the potential privacy risks, the use of text messages for communicating with patients is increasing. This has prompted the American Medical Association (AMA) to discuss the issues surrounding the use of SMS messages and HIPAA-compliant texting platforms at next month’s AMA House of Delegates annual meeting. The AMA has already issued guidance for healthcare providers on the use of email, although guidance on the use of text messages has not yet been issued. Current guidance is therefore expected to be expanded after the meeting to cover the use of text messaging between patients and physicians to help healthcare providers avoid privacy – and HIPAA – violations.